Headie continued a Gangway tradition of completing her championship with multiple breed wins over top-winning specials and multiple group placements. She finished at ten months of age from the bred-by class. 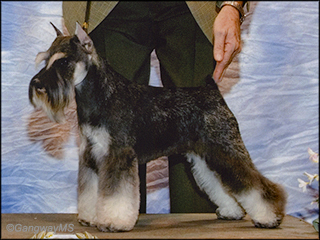 She is the ninth Gangway champion to finish its championship on one coat as a puppy. She is the fourth champion for her dam. Shown sparingly as a special Headie has been ranked in the top thirty in three different years. She is now the top-producing dam of an all-champion litter of three with more to come.